Refael Botbol is the Director of Professional Services for BlazeMeter and manages the delivery of BlazeMeter’s Enterprise projects. He has nearly 15 years of end-to-end experience, ranging from development and system engineering up to customer-facing positions. His proficiency includes operating systems and performance testing, leading multiple web-based platforms projects, including technologies such as Apache, JBoss, Microsoft IIS, IBM WebSphere, and complete deployment in enterprises including high familiarity with implementation needs. 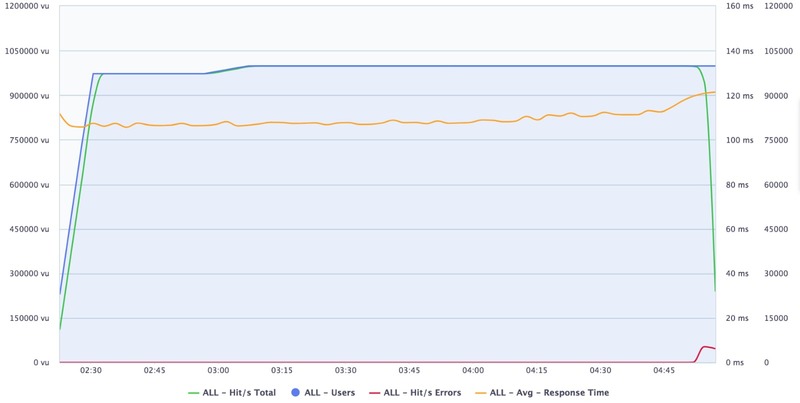 This article will describe the steps you need to take to easily run a load test with 50K concurrent users test (as well as bigger tests, up to 2 million users). Before you begin, make sure to get the latest JMeter version from the JMeter Aapche community jmeter.apache.org . Before you get started, you need to download the JMeter Plugins Manager. Once you've downloaded the JAR file put it into JMeter's lib/ext directory. Then start JMeter and go to "Options" menu to access the Plugins Manager. You will need to change certain parameters such as Username & Password or you might want to set a CSV file with those values so each user can be unique. Keep your script parameterized , and use config elements such as HTTP Requests Defaults to make your life easier when switching between environments. Start debugging your script with 1 thread, 1 iteration, using the View Results Tree element, Debug Sampler, Dummy Sampler and the Log Viewer opened (in case some JMeter errors are reported). If you intended that each user be unique - is that so? If you are doing a registration process, look at your backend - are the accounts created according to your template? are they unique? If you are using your own proprietary JAR file(s) be sure to upload it too. If you are using more than 1 Thread Group (or not the default one) - make sure to set the values before uploading it to BlazeMeter. If that's your first test - you should review this article about how to create tests in BlazeMeter. SandBox it actually any test which has up to 300 users, uses 1 console only and up to 50 minutes. The configuration for SandBox allows you to test your script and backend and ensure everything works well from BlazeMeter. To do that, first press the grey button: JMeter Engines I want complete control! - to get full control over your test parameters.. If you still having trouble look at the logs for errors (you should be able download the entire log). This will allow you to get enough data during your ramp-up period (in case you will get some issues there) and you will be able to analyze the results to insure the script executed as expected. You should look at the Waterfall / WebDriver tab to see the requests are ok, you shouldn't get any error at this point (unless that was your intention). You should watch the Monitoring tab to see how much memory & CPU was used - this should help you with step 4 while you will try to set up the amount of users per engine. Now, that we are sure the script runs flawlessly in BlazeMeter - we need to figure out how many users we can apply to one engine. Here, I will give a way to figure this out without looking back on the SandBox test data. Use 1 console and 1 engine. Run the test and monitor your test's engine (through the Monitoring tab). Look at the point of time you first got to 75% and then see how many users you had at that point. This time put the ramp-up you want to have in the real test (5-15 minutes is a great start) and set the duration to 50 minutes. You can go safer and decrease 10% of the threads per engine just to be on the safe side. We now know how many threads we can get from 1 engine, at the end of this step we will know the amount of users 1 Cluster (test) can get us. A Cluster is logical container which has 1 console (only 1) and 0-14 engines. The maximum number of 14 engines per console is based on BlazeMeter’s own testing to guarantee that the console can handle the pressure of 14 engines which creates a lot of data to process. So at this step, we will take the test from step 4, and change only the amount of engines and raise it to 14. Locate your console label (you can find its name if you will go to the Logs Tab -> Network Information and look for the private IP of your console) - it should not reach the 75%CPU or 85% Memory limit. We've got to the final stage. We know the script is working, we know how many users 1 engine can sustain and we know how many users we can get from 1 Cluster. So to do that, we will need to create 50,000 \ (500*12) = 8.3 clusters.. Instead of 12 engines per cluster we will use 10, so we will get 10*500 = 5K from each cluster and we will need 10 clusters to reach 50K. Changing the name of the test from "My prod test" to "My prod test - slave 1". So we go back to our test in step 5 and under the Advanced Test Properties we change it from Standalone to Slave. Pressing save - we now have the first out of 9 Slaves and 1 Master. Go back to your "My prod test -slave 1". Now repeat steps 1-5 until you create all 9 slaves. Go back to your "My prod test -salve 9" and press Duplicate. Change the test name to "My prod test -Master". Check all the slaves we've just created (My prod test -salve 1..9) and press save. Your Master-Slave test for 50K users is ready to go. By pressing start on the master you will launch 10 tests (1 master and 9 slaves) with 5K users from each one. You can change each test (slave or master) to come from a different region, have a different script/csv/other file, use different Network Emulation, different parameters. The aggregate report of your master and slave will be found in a new tab at the master report called "Master load results” and you could still see each individual test result by simply opening its report. Want to easily run performance tests for up to 50,000 virtual users, and even up to 2 million virtual users? You can try out BlazeMeter for free. Just put your URL in the box below and your test will start in minutes.